The following key combinations are defined but not activated. You can activate them in the "Keyboard" settings. Convert the marked text from/to hexadecimal series. key combinations are taken from the English-language terms: upper case, lower case and proper case. Clipboard Master is a clipboard organizing software. It allows you to copy, paste, collect, organize and store text, images and more. Clipboard Master has features like screenshot tool, text templates, and hotkey support. 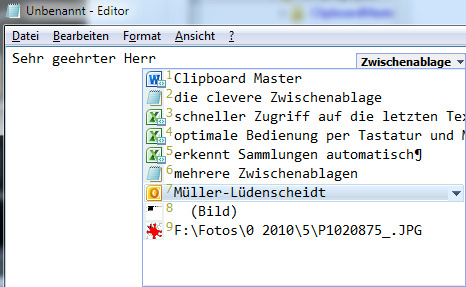 What is your favorite Clipboard Master hotkey? Do you have any useful tips for program? Let other users know below.